Our NEWLY built villa is decorated to a very high standard and is fully air conditioned. It comprises of 2 master bedrooms each with an ensuite bathroom. There are 2 further twin rooms and another bathroom. 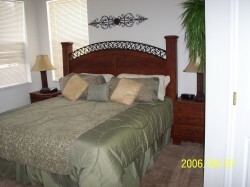 All rooms are superbly decorated, have ceiling fans, walk-in closets and TV�s. As you enter the villa you will be welcomed by a luxurious living and dining room. There are two sofas, one of which converts into a sleeper sofa. 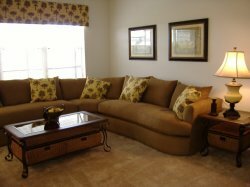 You will then lead into our spacious family room which has a 32" TV, DVD/VCR player, stereo system and Playstation 2. Our fully equipped kitchen has a breakfast bar and table which overlooks our fantastic pool. The pool and deck area is a great space for all the family to relax after your busy days at the parks or shopping as there is plenty of pool furniture not to mention the Florida sunshine. 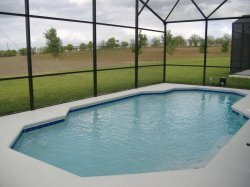 The Florida weather is great but we do recommend pool heating in the cooler months as the water temperature does drop. Safety netting is assembled around the pool area for all guests safety. There is a laundry room with a washing machine and tumble dryer that leads to the double garage. We have just converted the garage into a great family games room. There is a fooseball table, an air-hockey table and an electronic darts board. There is also a table with 4 chairs where you can enjoy a few games. Our villa is perfectly suited for your families needs and great for two family's sharing (no disputes as to who has the ensuite!). 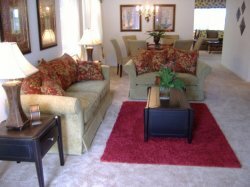 We are confident you will feel completely at home and will want to return time after time. We offer last minute discounts so always contact us to see if our villa is available.